Employees must first know there is a new system and learn what to do with it. An email referencing the new wiki is a good start, but it will almost never lead to great enthusiasm about the new system. You'll need to put more energy and ingenuity into promoting the wiki. Training is generally necessary, unless users are comfortable with new technology and can learn to use the special functions effectively and efficiently on their own. Information and training can help reduce users' fear of new systems, and convey the reasons why this new system is being introduced and how it will benefit them in their daily work. Blog posts, articles in employee magazines, internal news, etc. : Use topic-based morsels of information about the system and its concept, as well as possible use cases within the company, its benefits and advantages, and the underlying reasons why it's being introduced. User workshops: Give a personal introduction to working with the wiki and provide hands-on training. Screencasts: Offer videos about the basic and special functions of the wiki and demonstrate steps to complete specific (every-day) tasks. A wiki influences many processes and concepts in a company and leads to changes - but only when people use it. A core aspect of a successful wiki launch campaign is highlighting that the wiki is something new and appealing: You will find it worthwhile being interested in this tool and invested in the reasons why we want to use it. The wiki can be helpful and useful for every employee. Attention-getting marketing helps to draw attention to how the company wiki can or should be used. 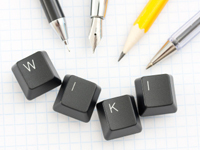 Options for sparking interest in the wiki begin with promotional items such as simple ballpoint pens or notepads, which - provided they have a clear message - remind users to use the wiki. Posters or cardboard displays, for example, offer more space for specific or important information. They are best placed where many employees are located (e.g. in the canteen or in the entrance area). Examples of such giveaways and gimmicks can be found here. Communicate interesting wiki documents by email: Useful information makes it easy to entice users into the wiki. Place posters in the corridors: Pique curiosity, communicate the core message, convey specific information. Encourage viral action: Unusual internal marketing actions that spread, surprise and pique curiosity. Hold giveaways for employees: Useful branded gifts are used to consistently spread awareness and make the "wiki" more visible to employees (e.g. pens, post-its, blocks, cups). A collaboration day: Involve employees to help develop and shape the the wiki, and gather information about possible use cases suggested by employees. Wiki usage survey: Get feedback on acceptance and provide an opportunity for employees to suggest optimizations. What are the benefits of a launch campaign? An introductory campaign serves as an incentive to make employees enthusiastic about the idea behind the new tool and motivates them to participate. It directs the attention to the wiki and arouses interest. Widely advertising the wiki in the employees' immediate working environment makes users constantly aware of the benefits of the wiki through posters in the corridors, blocks and ballpoint pens in meeting rooms, coffee cups with printed information on the table, etc. When an employee thinks about the wiki and feels positive (because he/she gets something as a gift or finds something funny or beautiful), the idea is more likely to be memorable than when neutral communication methods are used to publicize the new wiki. By communicating the most relevant benefits of working with the wiki in a targeted way, employees become aware of the reasons why the system is being introduced. This increases the willingness to participate. If an employee’s first experiences with the system are positive and they know how they will benefit from using it, they will identify with the wiki and perhaps perhaps even become enthusiastic. Such colleagues become multipliers within the company and infect other colleagues with their enthusiasm. In a wiki launch campaign, it is mainly a matter of pushing employees in the right direction. You want this direction to say "Want to work with the wiki" instead of "Have to work with the wiki..." We will be happy to help you to establish this path! We are wiki launch experts! Are you thinking about a new wiki or intranet? Do you want help with a launch campaign, or to encourage enthusiasm for and boost usage of your existing wiki? We are experts in corporate communications and we have experience from more than 100 successful wiki/intranet projects. We know the diverse technological, organizational and corporate cultural aspects that can influence the success of your project. Feel free to contact us, with no obligations.